Chobe National Park, Botswana – The elephants swim across the river in a straight line, trunks jutting out of the water like snorkels. With low, guttural bellows, they push their bodies together, forming a living raft to bolster a calf too tiny to stay afloat on its own. This pachyderm flotilla has a dangerous destination in mind: The grassy shores of Namibia, where elephants are literally free game for legal hunters. The animals will risk their lives to feed here before fording the Chobe River again, back to the safety of Botswana’s Chobe National Park. To avoid ivory poachers in neighboring Namibia, Zambia, and Angola, elephants like this family are fleeing in astounding numbers to Chobe, where illegal hunting is mostly kept in check. “Our elephants are essentially refugees,” says Michael Chase, founder of the Botswana-based conservation group Elephants Without Borders, which works to create transboundary corridors for elephants to travel safely between countries. But while Chobe offers some protection, it’s not the most welcoming stronghold. The increasingly dry ecosystem is buckling under the pressure of supporting so many of the six-ton animals, which each eat 600 pounds of food daily. Helicoptering above the park on a searing-hot October afternoon, the landscape looked, as Chase puts it, nuked after a war: Only a few spots of green interrupted a flat, seemingly endless terrain of desiccated trees and brush. Gray hulks, massive even from the air, moved slowly below, following their noses to the few water holes still left at this time of year. The rains should come soon, but in the meantime, the elephants are desperate. The animals can drink river water, but they prefer to drink from remote water holes because rivers are usually risky places to linger. These elephants have already eaten some plants, such as marula and acacia trees, to local extinction. Forced to eat bark, some Chobe elephants have died from blocked intestinal tracts, Chase says. “The irony of elephants seeking refuge in the Kalahari Desert, an environment not compatible to sustaining these numbers of elephants, is a tragedy,” he says. Under siege from poaching and development, African elephant numbers have plummeted by 30 percent in recent decades, according to the 2016 Great Elephant Census, the biggest continent-wide elephant survey ever undertaken. Once ranging from the coastal plains of Cape Town to the foothills of Mount Kilimanjaro, the species has fallen from 1.3 million in the 1970s to about 352,000 today, according to the survey, which was led by Elephants Without Borders. The International Union for Conservation of Nature lists the African elephant as vulnerable to extinction. When Chase began collaring and tracking the giants 20 years ago, he was surprised by his initial GPS data, which showed elephants fleeing unsafe territories for safe ones, and then making epic trips back home. For instance, elephants that had likely escaped Angola during its bloody civil war in the 1970s and ’80s traveled hundreds of miles back to Angola in the early 2000s, his data revealed. Other elephants at the turn of the century returned to Namibia and Zambia, where rampant poaching had pushed them out. “Unfortunately, this time of peace was not to last,” Chase says. Between 2011 and 2014, when the demand for ivory in Asia boomed once again, the elephants’ movements stopped dramatically. They stayed put in Botswana, and their numbers are mounting each year. About 130,000 of those survivors now live in Botswana, the most in any country. Chase worries that poachers are following them—55 elephants have been killed illegally in Chobe National Park in recent months. How the big-brained creatures know to escape danger—and where to go—is part of George Wittemyer’s research in Kenya. 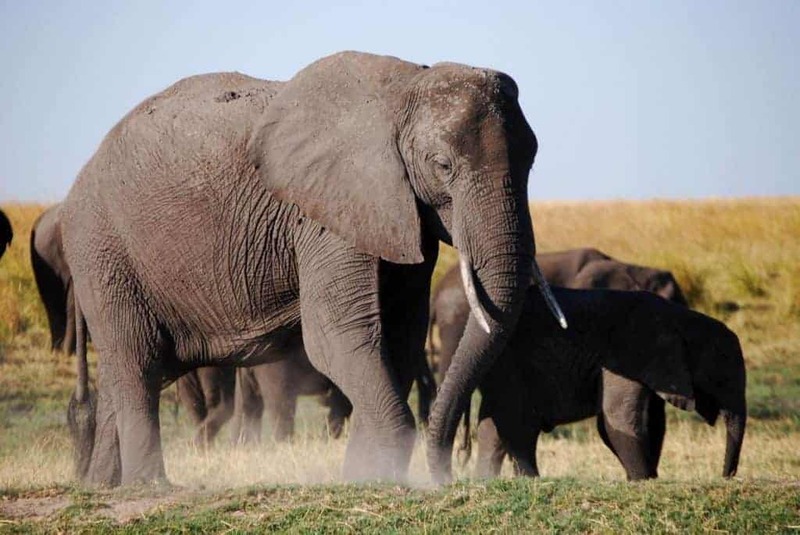 As in Botswana, Kenyan elephants can discern boundaries of protected areas—such as Samburu National Reserve and Amboseli National Park—without the aid of fences or other markers. In a recent study, Wittemyer and his colleagues found that elephants living in a patchwork of protected and human-dominated land will shift their circadian rhythm to rest more during the day, which they’ve learned means fewer encounters with people. In such places, the animals also choose less populated areas to rest—even if they are farther from water. Then, under the cover of darkness, the elephants make beelines for water holes, dashing through places where people or poachers may lurk. “It’s been remarkable to see the way they will identify areas they see as safe and move rapidly through areas they don’t see as safe,” says Wittemyer. In protected areas, elephants will switch this behavior and hang out at water holes all day. The herbivores’ evasive skills are due in large part to their highly sophisticated spatial memory. Satellite data from collared elephants in Namibia’s Etosha National Park show that the animals travel the fastest, most direct route possible to water holes, according to a 2015 study co-authored by Wittemyer. These animals take the most efficient path to water sources regardless of where they are starting from, suggesting they maintain detailed, wide-ranging maps in their heads. Joyce Poole, co-founder of the conservation group ElephantVoices, has studied elephants in the wild for 41 years, identifying hundreds of postures and gestures that show the brainy creatures can consciously make decisions—and act on them. “Elephants may look as if they are doing nothing, but often if you look closely, you can see subtle signs that they are thinking, contemplating,” says Poole, who is also a National Geographic explorer. Poole says that elephants are superb at hearing and smelling danger. For instance, experiments in Amboseli National Park show that elephants know how dangerous certain humans are from how they speak. Elephants in the region can distinguish between the language of the Maasai, an ethnic group that sometimes hunts them, and other languages, a study found. “Elephants use their cognitive and sensory abilities to avoid poachers as well, but they aren’t always successful, especially when poachers use sophisticated equipment,” says Poole. Several countries, including Kenya, have burned ivory stockpiles in recent years to symbolize their commitment to halting the trade. But poaching shows no sign of stopping: Illegal killing for ivory is so intense that in 10 years scientists expect to lose 50 percent of Africa’s remaining elephants, Chase says. “As long as there are people out there [who] feel elephants are worth more as ivory trinkets than living animals, we have a battle ahead,” says Poole. Anti-poaching and park management are virtually nonexistent in southeastern Angola and southwestern Zambia, and until that changes, Chase says it won’t make sense to establish elephant corridors. “Those habitats need to be secure, otherwise we are sending elephants to a certain death,” he says. And in some cases, Wittemyer notes, there’s not much left for the elephants to go back to. Across much of Africa, ill-maintained parks have become overrun with domestic livestock that have denuded the land, he says. Meanwhile, many countries in Africa are expected to double in population by 2050, leaving less space for wildlife and fueling the growth of large-scale development—major highways and railways are sprouting everywhere, severing elephant populations from one another. Still, there are some victories worth celebrating, the scientists note. Uganda, Namibia, and Gabon have stable or recovering elephant populations. And in Botswana, ecotourism—which includes wildlife safaris—is the second largest foreign exchange earner, which means the country is “reaping the rewards of successful conservation,” Chase says. Perhaps most importantly, “the world is listening to the plight of elephants,” he says, citing the growth of wildlife documentaries like Savage Kingdom as one example. This article was first published by National Geographic on 23 Nov 2016.